demand excellent comfort and stability. C4 bass stool for children 22″ Aluminum Frame. Click on the Allegro Chair icon for details and features. The Allegro is the first professional orchestra chair made of aluminum with back support that can be placed right at the lumbar or where you prefer. Ergonomic, ultra-light, modern, classy with a ‘take note’ look onstage. The back support is separate from the frame and is removable if desired. This is truly a musicians’ chair! 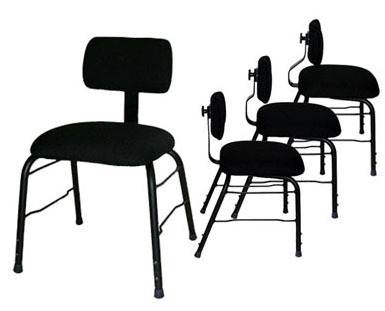 Insist on the best – hospitality chairs are meant for hotels and other institutions, not concert halls. Discounts available on quantity. Call us to discuss, email, telephone, skype. At first glance, it may appear that the Allegro is too complicated to move quickly on-/off-stage. If preferred, all the Allegro chairs for your stage can be set at one height (for example, set all the chairs for medium height – we can ship them preset); and choose one style back support (for example, the regular straight version). Each chair is set the same, and you have a superb orchestra chair. The various adjustments are still available and the Allegro can be reset, as the orchestra may require. SO DOES A GREAT CHAIR! specially priced as quantity lasts. Low profile 20″ base, height range 13″-16″. Full details on Celtic Harp page. 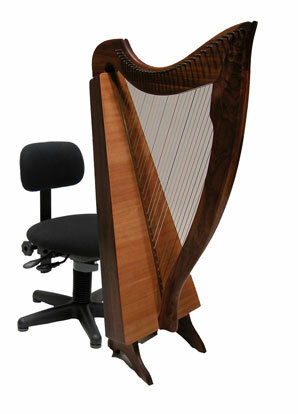 see our Celtic Harp page. Request free Catalogue by email. Concert Design, since 1995, creating seating for all musicians. Prices on web pages are in U.S. Dollars and are up to date. Discounts available on quantity. Discuss with us. on email below to add your email to our address list, request free brochures, ask us any questions, request assistance, let us know what you think about our products.